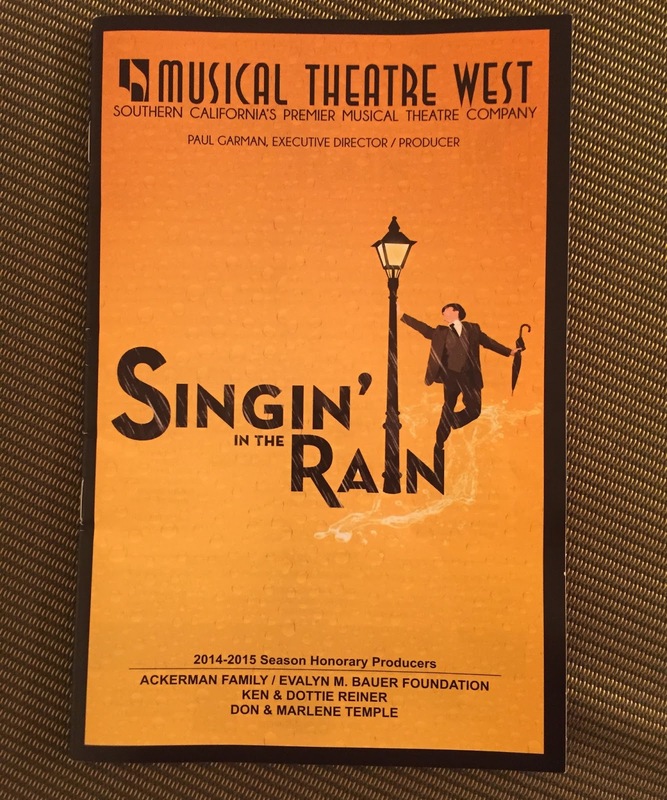 I have been a season subscriber to Musical Theatre West for a few years, and they are one of the best entertainment values in town. They put on very good shows for a modest price, and though I gripe about minor things, overall I am a big fan of what they do. So, I was beside myself when I saw that Les Miserables, one of the most popular musicals of all time, was on their schedule for the 2014-2015 season, and I was a little disappointed to see Singin’ in the Rain on list. I was completely wrong – Les Mis was so-so, and Singin’ in the Rain was fabulous! It even rained when we went to the show, which is no small feat in a Southern California summer. The Singin’ in the Rain stage show is based on MGM’s 1952 hit film that starred Gene Kelly and Debbie Reynolds. The show was adapted with a book by Betty Comden and Adolph Green, lyrics from Arthur Freed, and music by Nacio Herb Brown. It stays fairly true to the movie version, and it includes your favorite songs from the movie, including the title song, “Good Morning,” and “Moses Supposes.” The show originated in 1983 in London then made its way to the states where it premiered on Broadway in 1985, with a run of 367 performances. Since then it has been revived regularly, as it is still a popular show. It is a fun story, and if you are not familiar with it, here is the skinny. 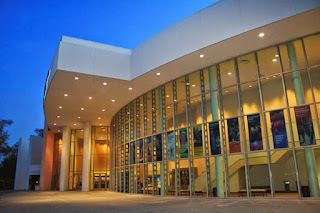 The play is set in Hollywood in the transitional era from silent films to talkies. Don Lockwood (Leigh Wakeford) and Lina Lamont (Rebecca Ann Johnson) are an on-screen couple who run into trouble because Lina has a voice that can make little kids cry and old ladies faint. Don falls for a nobody actress, Kathy Selden (Natalie MacDonald), and his old pal Cosmo (Justin Michael Wilcox) brings a bit of hilarity to the action. There is a little bit of everything in the story, but the guy gets his girl in the end. Of course. In the Musical Theatre West version, the leads are very good, with a standout performance by Leigh Wakeford. This man is an excellent singer, a gifted dancer, and a pretty good actor too. Rebecca Ann Johnson is perfect as Lina, and her shrieking voice is still rattling around in my head a few days later. Wilcox almost stole the show with his comic timing, and MacDonald is a very convincing Kathy, though her hair was done terribly -- this show is set in Hollywood, not some mousy-haired east coast city (or Detroit). The rest of the leads and the chorus also do a fine job and this is a huge show, with over thirty on-stage characters. They were ably led by Jon Engstrom who takes care of both the director and choreographer roles. 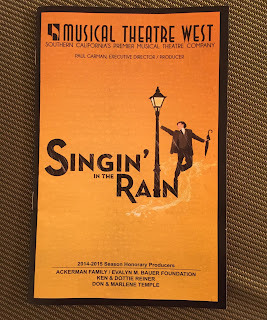 MTW also provides a very good orchestra for Singin’ in the Rain, with more than twenty musicians in the pit. John Glaudini is the musical director, and he does a great job of bringing Brown’s music to life. As always, it is disappointing to see that the musicians get no credit in the program, and there is no indication of whether they are union members or not. Shameful. Making up for the terrible job they did on the sound for Les Miserables, the production staff really step things up a notch for this show by bringing on a new sound company. There is none of the previous confusion about which microphones were supposed to be turned on, and everything is easy to hear with a good balance between the orchestra and the cast. There are no problems with the rain sequence, though there is a bit more noise from the umbrella than I would prefer – but that is an almost impossible task for live theatre. They even tape microphones to Wakeford’s tap shoes, so the audience gets the full Gene Kelly cinematic effect. Karen St. Pierre’s costumes certainly seem authentic, and Dan Weingarten’s lighting is spot-on, but the real props have to go out to Michael Anania for his set designs (pun intended). The show takes up a huge amount of stage, and it is full of wonderful elements that really make the show pop. Of course, the most impressive element is the rain scene at the end of Act 1, which is really quite astounding. The water from the show is supposedly recycled, an important note in the drought-ravaged Southland. Of course, I always have a few things to complain about. For starters, this is a long show and this time it did not start on time, which was compounded by about 15 minutes of speechifying from Mr. Garman. They do not do this sort of thing on Broadway or anywhere else I go to see a show, so I am not sure why there is the need to tell the audience business that could easily be handled on their website or through an e-mail. The acts of the show are unevenly broken up with two hours (counting the late start and the speeches) before the intermission and about a half hour afterwards. If they started on time the intermission would hardly be necessary. Despite these few things, all of the other pieces came together in a wonderful way. 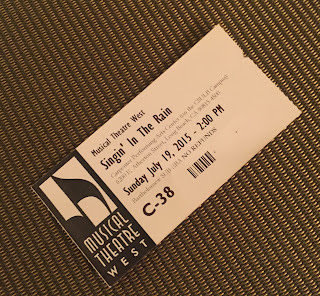 Singin’ in the Rain is a solid show with good performances and it is 3 hours of fun – trust me on this one! The show will be playing through July 26, so there is still time to see it, but tickets are running low and one of the shows is sold out. 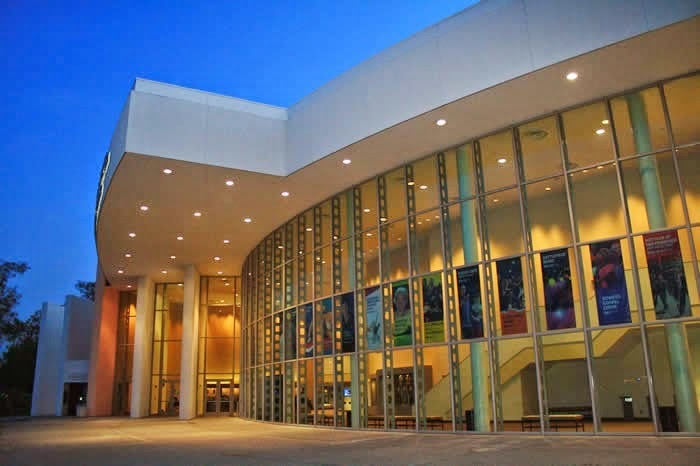 Ending the season on a high note, now is the time to make plans for next year’s season, which will include My Fair Lady, West Side Story, Dirty Rotten Scoundrels and Sister Act. You can’t beat the value!